Discover Our Exciting Summer Camp Opportunities in New Port Richey! Is your child itching for summer to start? At Discovery Point Trinity, we know what a joy summer can be for children. 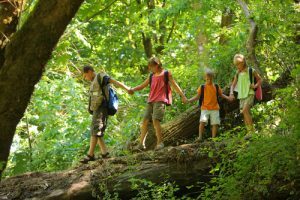 Our summer camp in New Port Richey allows children to make the most of their time off school through our hands-on activities, adventure-packed field trips, and inspiring life lessons. Our “Mighty Me!” program encourages campers to find their own superpowers while building relationships and making memories to last a lifetime. Each week, we take a literature-based theme and elaborate upon it through our engaging activities and fun projects. These themes allow children to put what they’re learning through literature into action, solidifying their understanding of important values like kindness, sportsmanship, and self-esteem. By the end of the summer, your child will realize that being a superhero is about being the best version of his or herself. By developing his or her talents, making lasting friendships, and going on adventures with other campers, your child will gain confidence and be ready to bring that confidence back into the classroom. Friendship. Children will learn that kindness and respect are essential to lasting friendships. Self-esteem. We help children uncover and appreciate their own superpowers. Caring for animals. From nurturing furry friends at home to animal rescue in the wild, we remind children of how they can make a difference. Self-reliance. Self-reliance becomes a fun adventure for campers thanks to our engaging activities. Sportsmanship. Our games and puzzles help children understand that true champions are good team players. Imagination. Children use their imaginations to build real-life creations. Health & Fitness. Campers learn about health, fitness, and caring for their amazing bodies. Brainpower. Our intellectually stimulating activities keep campers academic skills fresh. Contact Discovery Point Trinity today at (727) 375-0995 for details about our summer camp program or drop by our child care center in New Port Richey to learn more.